The Reggae Madness Flyer Template This template gives you the colorful and contrast you’ve wanted for a truly reggae themed template. Perfect for your reggae music event and other DJ, club, bar events. 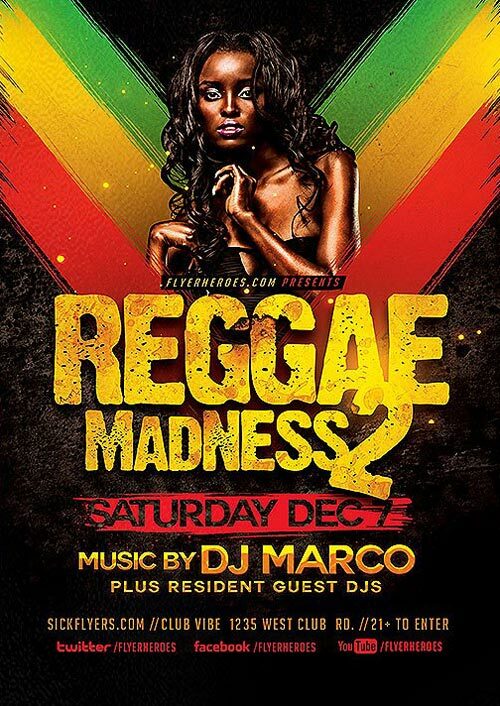 The Reggae Madness Flyer Template from FlyerHeroes are fully editable Photoshop PSDs. Once you have downloaded this template, using Adobe Photoshop CS4+ you can make use of this flyer design an unlimited number of times 100% royalty free. You are free to customize this design however you wish and use in both personal and commercial projects without ever crediting FlyerHeroes.